Hello, and welcome back to the West Texas Windshields blog! In a recent blog series, we spent some time looking at ways to “spring clean” your car and perform maintenance on your vehicle in preparation for the hotter months ahead. In today’s post, we would like to shift our focus to another subject that we at West Texas Windshields feel is incredibly important for our readers and customers in and around San Angelo: distracted driving. According to the National Highway Traffic Safety Administration (NHTSA), distracted driving claimed the lives of 3,450 Americans in 2016. In an effort to educate those people in our communities on how to become less distracted drivers here in West Texas, let’s look at some useful safety tips for you to consider, which could help you become a safer, less distracted driver. Cell phones have become one of the most distracting objects for drivers, as they are pieces of technology that we just can’t live without. Whether drivers read or write texts while driving, answer phone calls, or use their phone to take photos in and from their car, cell phones and smartphones can interrupt a driver’s focus. While these and other electronic devices are one of the biggest causes of accidents among teen and young adult drivers, adults are just as guilty when it comes to being distracted by their cell phones. It is best to avoid using your cell phone while driving and only using it in the case of an emergency. One way to limit your cell phone use is to place your phone into the center console or glove box while you drive so it does not become a driving distraction. You can also set it to airplane mode or use your “Do not disturb” settings, which will alert callers that you are driving and will call them back. If you’re like most people, you probably feel as if there is never enough time in the day to get everything done. This often causes people to do other things while driving, which distracts them from what’s on the road in front of them. This may include writing a shopping list, organizing a planner, eating a meal, putting on makeup, or even trying to schedule a doctor’s appointment over the phone. A good rule of thumb is to save all of your other tasks for when you’re not driving. This will allow you to focus completely on the road without being distracted by your phone, your notes, or anything else. We’ve all been there. You’re driving along a dark road late at night and you suddenly feel your eyes getting heavy. You try to focus on the road but the hum of the tires on the pavement and the wind gliding over your vehicle have you feeling as though you could just close your eyes and drift off to sleep — this could also mean you drift into a ditch or into oncoming traffic. Whether you’re on a road trip and driving through the night to save time, driving home from a late night concert, or simply worked too late at the office, if you feel drowsy, your best option is to pull over and rest or stop for the night. This will limit your risk of not only hurting yourself in an auto accident, but also from harming others on the road. With all of the car stereo options available these days, there are many hands-free stereos that allow you to enjoy all of your favorite music without fidgeting with CDs, iPods, and smartphones while you drive. One way to be a less-distracted driver is by setting up the Bluetooth function on your phone and stereo. If you don’t have a Bluetooth option, you should plan to listen to just one album on your stereo to avoid having to mess with your stereo while you’re driving. You can also set your smartphone or other listening devices to the shuffle play setting so you get a nice mix of music without having to turn your attention away from the road to change your tunes. If you have a damaged windshield, the cracks, chips, and other damage can distract you from the road and can obstruct your vision. To avoid this, it’s best to bring your vehicle into West Texas Windshields in San Angelo and let our expert windshield technicians replace your windshield with one that is clear and free of obstructions. When you’re in need of a windshield replacement or auto glass repair, and you search “windshield replacement near me,” don’t just go with any auto glass company; rather, choose us! At West Texas Windshields, we always have our clients’ best interests and safety in mind, which is why we won’t make you wait for weeks to perform a Top Rated Local® windshield replacement. In fact, we treat each and every customer like family, making your safety, the safety of your family, and the safety of other drivers our top priority. Give us a call today and let us make your windshield less of a distraction and more of a safety feature — as it should be. 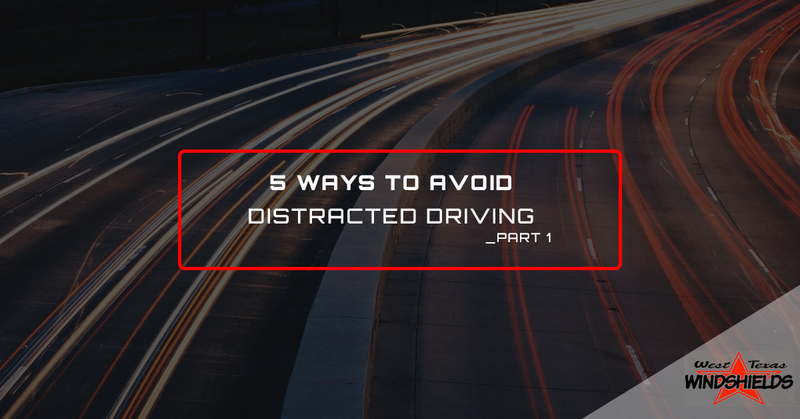 Be sure to join us for part two of this short blog series to learn how to become a less distracted driver. Until next time, thanks for reading!